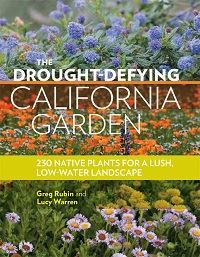 We welcome Greg Rubin and Lucy Warren, co-authors of a comprehensive guide to landscaping with California natives, The Drought-Defying California Garden. California native plants are among the easiest and most drought tolerant plants for local landscapes—if they are handled correctly. Popular local authors, Greg Rubin and Lucy Warren, return with new and exciting information making it easier than ever to create a beautiful evergreen California native landscape. Piggybacking on their years of experience and their first best-seller, The California Native Landscape, the authors designed their new guide to help homeowners jump right into native landscaping. One of the key differences between natives and other plants is that they thrive in compatible plant communities. Learn about new tools which enable people to recognize the right environment for the plant palette they select and to easily choose the plants which grow well together. Lucy Warren, who has an extensive background in marketing research and her own consulting firm, has been long fascinated with plants and horticulture. She is a UCCE Master Gardener and an experienced garden writer who authored a column on edible plants for the San Diego Union-Tribune and served as editor of California Garden magazine. She is the assistant coordinator for the the Spring Home/Garden Show and is a former board member of the San Diego Horticultural Society and the Pacific Horticulture Society. Their books will be available for sale and signing at the meeting.